As a business owner, you have a variety of technology available that might benefit your company and its employees. 2016 was an exciting year for this type of technology, and a few systems that premiered helped set the pace for this year as well. Perhaps you want to add new enterprise technology systems to your business but are not certain which would best suit your needs or how to train your employees to use them effectively. Fortunately, there are several tips you can use that may help you integrate these systems into your company with a minimum amount of trouble. Choosing enterprise technology can be a daunting process for you as a business owner, but you can reduce any stress that might result from it by understanding which technologies your company would most benefit from before you buy. Your business is unique, after all, so taking the time to understand its needs and the needs of your employees may help you narrow down your choices. One method you might consider using for gaining an understanding of your company’s needs is to review the stakes for each department. For example, how will adding a new technology impact your marketing or IT specialists? Will the technology benefit each of these departments, or will certain aspects of how it operates cause conflict? These are questions to consider before you add a new enterprise technology to your company’s daily processes. Like any business owner, you have probably set a few goals for your business, both short and long term. Investing in enterprise technology may help you reach these goals; however, this can only be true if you review how the systems operate in terms of helping you reach these milestones. For example, if you are considering fog computing for your business, ask yourself about your data goals and whether you are seeking to handle it with greater efficiency, which is a goal this system may help you achieve. Reviewing your company’s goals may also help you save time and money when it comes to choosing new technology that every employee will use. The more employees that have access to such a system, the more valuable it may be, so you might want to consider how you want to connect your departments with enterprise technology before you install a system. The more goals you can reach for each sector, the more effective that chosen system can be. 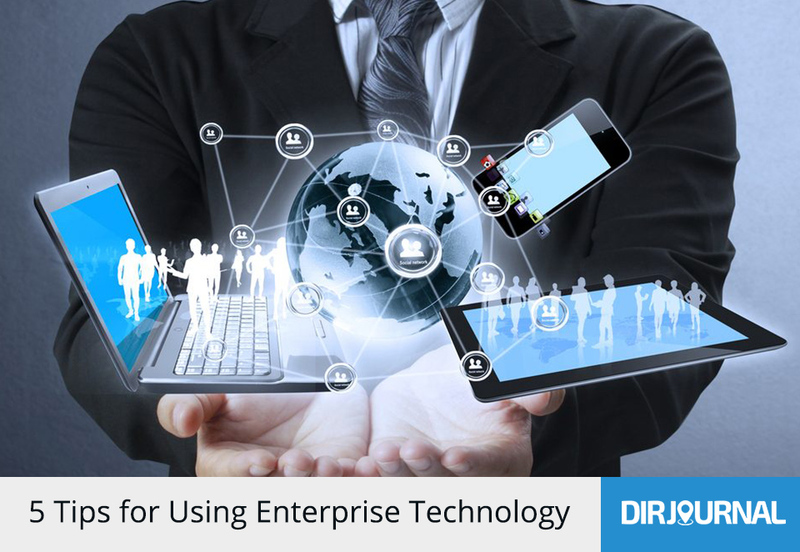 While running your company probably keeps you quite busy, remaining aware of new technology trends as they emerge can help you understand which types of enterprise technology might benefit your business the most. There are several ways you can keep up with the news without being overcome by it, especially if you are only interested in certain aspects as they relate to your business. One way to stay current with technology news is to set up alerts for certain keywords. For example, if you want to keep up with mobile technology, you can ask your favorite search engine to alert you when news articles or breaking news related to the topic become available. You can also use industry leader names, such as telecommunications expert Donald Burns, as alert phrases for certain technology sectors. One key factor in using enterprise technology is learning what to expect from each system you use. Because each of these technologies is different and they each run on individual and unique platforms, you cannot expect them all to work the same. As such, proper training and understanding will be necessary on the part of every employee who uses the system. While you cannot anticipate every action or result of technology, especially when it is being used by a number of people at the same time, understanding how a system is supposed to operate on a daily basis can help you handle problems if they should arise. When you know what to expect, you and your IT team may be able to better support a system’s daily processes. While training your employees on any enterprise technology is an important aspect of it being a successful tool for your business, you should also encourage hands-on learning as well. Getting to know an app, a data storage system, or digital customer service management is a process that requires not only practical learning, but intuition as well. For example, if one employee is a visual learner and another has a stronger tactical learning process, hands-on learning can allow them to use their strengths to their best advantage when it comes to understanding a new system. Enterprise technology can be a boon to your business, no matter its size. However, taking the time to understand how it works in relation to your company’s goals, your employees’ needs, and how it will affect each department and their processes can ensure that becomes an integral part of your success as a business owner.